Looking for more restaurants in Paris? Don’t miss out on getting a copy of our Paris Night Guide where we share a long list of our favorites in the city! If you love discovering the food of the different cities you visit then Paris is a great place to exercise your taste buds. Just as The City of Lights is considered a melting pot in the diversity of people and cultures, so is the cuisine. When it comes to a food guide, Paris allows you to find anything from traditional French cuisine, Mediterranean, Korean, Japanese, West African food, down to Mexican street food, good ol’ American styled burgers and the best falafel in Paris—even kale is hot these days. For a food lovers guide to Paris, read on. In the past 3 years living here I’ve discovered that a lot of my time in Paris is spent sharing a meal with friends, resulting in a full collection of favorite places to eat for a wide variety of cravings, which I’ve compiled into this guide. You won’t find the common touristy places most travel books recommend because that information is already readily available. This is a more local side of dinning in Paris that captures the many choices of cuisine from high-end places, to more intimate hole in the wall, down to my favorite coffee shops and bakeries where you can find the best croissants. Explore the city with this full list! Le Bouillon Chartier (above) is one of the oldest brasseries in Paris dating back to 1896. 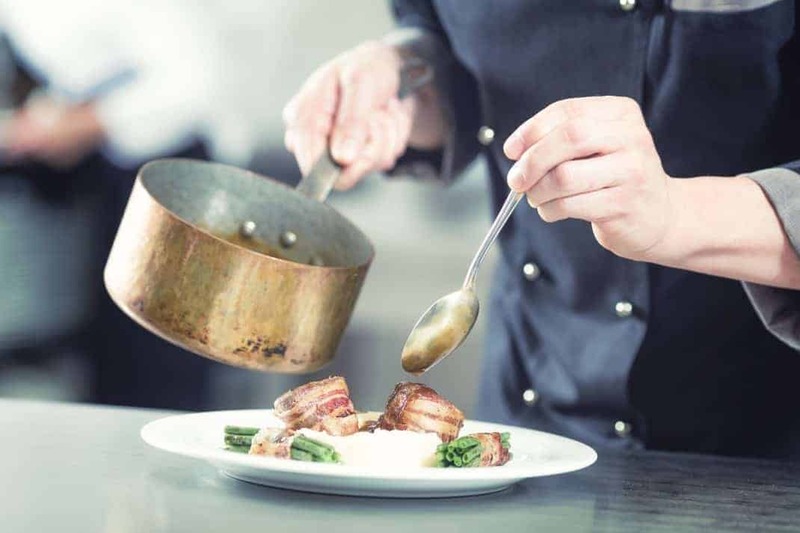 The brasserie was born out of the concept to provide a decent meal at a decent price and give customers good service in order to earn their loyalty. Today the concept, décor and commitment to providing a genuine dining experience still remains the same. And the best part is the prices… you can get an entrée for about 2-5 euros, a main course 6-12 euros, and even end with dessert for less than 5 euros. Mon Oncle le Vigneron is cozy, family styled dining experience. The concept is of this restaurant is that the chef buys fresh local ingredients from the market and then she prepares a different menu every day, based on what she has found. You have to call to reserve in advance because the restaurant doesn’t hold more than 4 tables at a time. Septime is a higher end dining option with one Michelin star that is very inventive with their menu options. This restaurant is on many ‘must eat in Paris’ lists across the globe. Each item on the menu has three ingredients, and you can even order a ‘carte blanch’ menu where you leave your menu choice up to Chef Bertrand to put something creative for you. La Cave de Belleville & Le 52 bar – France of course is the land of wine, so you should definitely taste some quality wine when you’re in town. La Cave de Belleville is in the artistic neighborhood of Belleville, they offer a wide selection of wines from many regions in France that you can enjoy with a meat and cheese platter. Le 52 wine bar is another place that I recommend for a nice selection of wine and to have a nice meal and they have really good desserts. Ellsworth taken American and French feel-good food and elevated their dishes to fine dining standards, all whilst retaining a cosy and relaxed atmosphere. Their menu is full of dishes evocative of what you may see at a country fair, or lovingly cooked by your grandma, but that’s its charm. They take the simple, yet delicious dishes we all know and love and refine them through careful sourcing and attention to detail. Ellsworth chef, Hannah Kowalenko is committed to taking home-made dishes to the nth degree with creating a very vegetable-centric menu which she adapts to the seasons. Everything, from the bread, yogurt, ricotta and sausage have been made on site, at Ellsworth, and as they say, the proof of the pudding is in the eating, and we recommend just that as they are genuinely delicious! Restaurant La Reine de Saba is the place to indulge in some flavors from Ethiopia. It is in the Oberkampf area and very well known and highly recommended by all the Ethiopians and Eritreans I know here in Paris. One piece of advice—don’t eat too much prior to coming because you will want to have as much room in your tummy to eat all their deliciousness! Djoliba is one of my favorite places to eat West African food—specifically from Senegal, Côte d’Ivoire, Mali, and Guinea. The restaurant is a little hole in the wall near Strasbourg St Denis which is like a ‘little Africa’ neighborhood in Paris. I stumbled across this place when I was in the area looking for hair supplies. The food is oh so good, the portion sizes are generous, and the prices are very affordable (9-12 euros). There aren’t many options to choose from so it makes ordering easy, but if your looking for a suggested dish I would highly recommend getting the grilled tilapia with a side of attiéké. Specialties Antillaises Menilmontant has amazing Caribbean food. Every time I have eaten there were tons of regulars from Martinique or Guadeloupe who come to get savors from home. In addition to food they have tasty tropical cocktails and it is a great place to go a lunch during the week or on a Saturday. The hours are a bit funky so make sure to check if their open before going. Piccoli Cugini is located in the Canal Saint Martin neighborhood which is full of restaurants, shops, and a great area to just go to for a stroll. This place has got everything from pizza, pasta dishes, Italian wines and desserts. The ambience is intimate and the staff is really friendly. Café Chilango It has taken me a while to find a decent Mexican food place in Paris. Being from LA, I have pretty high standards, and Café Chilango knows how to deliver. They make the best quesadillas and tacos I have tried in Paris with fresh guacamole—even fresh (no mix) frozen margaritas! Rice & Fish– If you looking for quality sushi that isn’t to expensive in Paris, I highly recommend Rice & Fish. There are two locations right next door to each other, one is dedicated to hot dishes like soups, tempuras and rice bowls, where as they other location is dedicated to sushi. The eclectic decor makes you feel like you’re somewhere in Japan, and they often have daily menus of the day to choose from. If you’re looking for a good Indian restaurant, all you have to do is head to the Gare du Nord area, the ‘little India’ of Paris. One of my favorite places is Le Dishny for their curries and Saravana Bhavan for their vegetarian selections and regional variety. MG Road is another nice Indian food option that has a bit more ambience and it’s a fusion of traditional Indian dishes that cater to the French palate. Falafel Street Marais– for the best falafel in Paris you should check out the Jewish quarter in the Marais, which is filled with tons of falafel places. One of the most famous among Parisians is L’as du Falafel (beware there is always a really long line), but you have many others to choose from that are equally good if not better. Marche des Enfants Rouges is one of the oldest covered outdoor markets in Paris dating back to 1600. Today you can purchase produce, flowers, and many cuisines in one place like Japanese, Greek, Moroccan, French and much more. Rue Montegreuilis a go to street when visiting Paris. It is a lively street in the center of the city full of markets, restaurants, pastry shops, boutiques and specialty food shops. I love going here to grab food related souvenirs or to grab a bite to eat at the many different restaurants on this street. My favorites are Monthai (Thai) and Au Rocher de Cancale (French). Blend Hamburger– This place has a special place in my heart, as I used to work there. I can attest that they have some of the best burgers in Paris. There is a fusion of traditional American burger inspiration fused with French ingredients such as homemade soft brioche buns and French cheeses. When I first started working there, they only had one location, now there are four! Le Tricycle is street food meets healthy food. Le Tricycle is a 100% veggie restaurant known for their hotdogs. Brunch is a thing in Paris, and there are quite a few places that really know how to do brunch well. Here are some of my favorites. Pavillion de Canaux is the coziest place to have brunch, like you’re in your own home. It was an old boat house along the canal de l’ourq. Each room has been converted into a cozy space where you can share a meal with friends and family—you can even eat in the bathtub! The brunch menu consists of tea or coffee, orange juice, bread and jam, a main dish of the day, and dessert. Holybelly – This place is always packed because all the Parisians and expats flock here on the weekend to get their brunch fix. Get there early, if there is a line it is worth the wait. Les Petits Gouttes is all you can eat brunch with never ending options! This place great because it is a big space that can accommodate large groups, a rarity in Paris. Le Recyclerie is built within an old, abandoned metro line station that has been transformed into a cool space for urban gardening and dining, constructed by 100% recycled materials. Beyond it’s brunch, it’s a cool place to just hang out as they always have fun expositions and events going on. Institut de Bonté is a new café, which is an extension of one of my favorite places in Paris to go out for drinks/party, Le Compotir General. Their café has a country table kind of feel just in front of the Canal St. Martin, they have a wide selection of teas, coffee, and homemade baked goods that change on a regular basis. Ob-la-di Café – This café is probably one of the most instragramed cafés due to its tiled floors and interior design, but the ambience and coffee is just as good. CREAM Café– This café is in one of my favorite neighborhoods, Belleville. It is a very welcoming place to grab coffee to go, or to stay and meet friends or get some work done. Merci Used book store– If you’re in the Marais wandering around stop by Merci Concept store. They have a used book store café, where you can grab a drink and snack before roaming back out on the streets of Paris. Du Pain et des Idées – You can’t visit Paris without having some really good pastries. Du pain et des idées is certified good by Parisians and pretty much anyone who lives in Paris. You just have to manage to get there during the week, as it is closed on the weekends. Liberté Patisserie-Boulangerie is on a street that is infamous for having a great amount of restaurants and cafes. They have an array of picture perfect sweets and fresh baked bread, including a chocolate baguette. Barbes Brasserie is bustling new restaurant and bar in the 18th district. Great place to grab a drink before dinner and experience a local, up and coming neighborhood of Paris. Le Comptoir General is my all time favorite place to go for a drink in Paris. It is a place that doesn’t need explanation, you just have to go check it out and find out first hand why it is so awesome! Ps. It is also a great place to people watch, lots of eye candy walking around. Candaleria is a small little taqueria in the front with a little secret back door passage to a bar. They have creative cocktail options, and it is a great place to grab drink to start off your night. I hope you enjoyed this article, you can also find it featured on Parlour Magazine.